In donation and transplantation, we’re out in the community with a very specific goal: to save and heal more lives by helping folks say YES. Right now, there are many people who are out in the community for other purposes. For some, they are driven by hate. This is what I’m thinking about right now: how can advocates for donation and transplantation, and #DonateLife, walk out into the world and be a part of the anti-narrative to a time filled with mistrust and hatred? How can we, as community-based volunteers and organizations, be unifiers, not dividers? Can we embody the values of our mission—to save and heal lives, to comfort folks who are suffering, to honor altruism—at a time when so much seems lost or muddled or angry or indifferent? What I can tell you is this: if you can walk out into an event this weekend, and show folks who may not expect kindness, kindness, show folks who may not expect compassion, compassion, and if you can listen just a little more than you talk, you’ll make a difference. Hello Brianna, did you see the article about the young man who had an…innovative new type of transplant in South Africa this week? What do I say if someone asks me about that at an event for Donate Life? Great question! If someone asks you about a new advancement in transplantation, it’s always good to start with the facts, add on some kindness, and end with a fact. So, start with a fact, add in some kindness, and end with a fact. I hope that helps! Do you have a question about donation or transplantation that is hard to answer? Email me, and I’ll happily share my ideas! Zion’s Transplant and Advocacy: What’s the Power of Two Small Hands? Zion Harvey, the first pediatric double hand transplant recipient, left the hospital this week after his landmark 11-hour operation in July 2015. With his departure from the hospital, many more patients may take his place; more than 200 inquiries about children with similar extremity problems have been received by the Children’s Hospital of Philadelphia (CHOP). This is not surprising, considering the worldwide media attention to the story of Zion’s new hands. In fact, NBC Nightly News anchorman Lester Holt reported that Zion’s story was one of the network’s most popular and widely shared stories – ever – on social media outlets. While not all children who could benefit from a vascularized composite allograft (VCA) transplant will be medically eligible, at least one other pediatric bilateral hand transplant candidate has been screened by the CHOP hand transplant program. Zion’s pioneering transplant makes him a powerful new ambassador for the program spearheaded by Dr. Scott Levin, now the world leader in this innovative regenerative transplant surgery. We know that Zion’s maturity was in part the reason he was selected to be the first pediatric patient to undergo this groundbreaking medical procedure, but it ultimately became his courageous attitude in the face of adversity that captivated the hearts and minds of Americans. To add a layer of importance to Zion’s ambassadorship, we know that the participation of African Americans in clinical trials has been low historically, in part due to high levels of medical mistrust. Zion’s family’s story (as well as his donor family’s story, should they choose to share) shows collaboration and consent with medical professionals for a breakthrough procedure, and how that collaboration and consent created a positive outcome. As Zion left the hospital on Wednesday, NBC News reported his desire to write a letter to his donor family in gratitude. The donation and transplant community have policies and best practices in place for this type of communication in order to ensure confidentiality. The donor family will be in control of when and how they choose to receive communication from Zion and his family. This protects the donor family’s grief process, and allows them to regulate if and when they are ready to seek connection with recipient(s). In most, if not all, cases, the 58 federally designated organ procurement organizations in the U.S. require that the transplant recipient’s letter be screened before forwarding it on to the donor family. , In the final step of this process, trained professionals provide education to the recipient, informing them that they may or may not hear back from the family. Again, it’s a matter of choice and consent for the families involved, two important principles that mediate donation and transplantation. That said, moving forward in the new era of healthcare communications involving social media outlets, will these practices and policies change? Will social media and other forms of digital communication make it harder to protect the confidentiality of donor families? These are worthwhile questions in an era where donation and transplantation can be live-tweeted (see the moving tweets of Stefan Wilson about his brother Justin, and the feat of live-tweeted transplant at Baylor). Providing safe communication between families who “opt-in” to disclosing their identities and experiences could pose new challenges for organ procurement organizations now and in the future. Not only does Zion want to write a letter, he also wants to mentor other children who may need a transplant in the future. This is not the first time we have been witness to mature pediatric transplant recipients starting their new lives as advocates for donation and transplantation. In February, to spread awareness about National Donor Day with the #GotHeart Campaign, we were honored to work with a pediatric liver transplant recipient and his mother who are advocates with Indiana Donor Network. Children who experience life-saving and life-changing events via donation and transplantation often provide extraordinarily powerful narratives to our community, and find that they can both inspire and educate the public with their words. Zion’s smile, sincerity, and courage has moved a nation to click, tweet, and share. Can he inspire Americans to make a life-saving decision, and register as donors as well? Time will tell us more about the power of those special hands. http://www.positiverhetoric.com/wp-content/uploads/2016/08/Positive-Rhetoric-logo.png 0 0 Brianna Doby http://www.positiverhetoric.com/wp-content/uploads/2016/08/Positive-Rhetoric-logo.png Brianna Doby2015-08-27 23:12:092015-08-27 23:12:09Zion’s Transplant and Advocacy: What’s the Power of Two Small Hands? Donate Life America, for coordinators, in the news, Say what?! 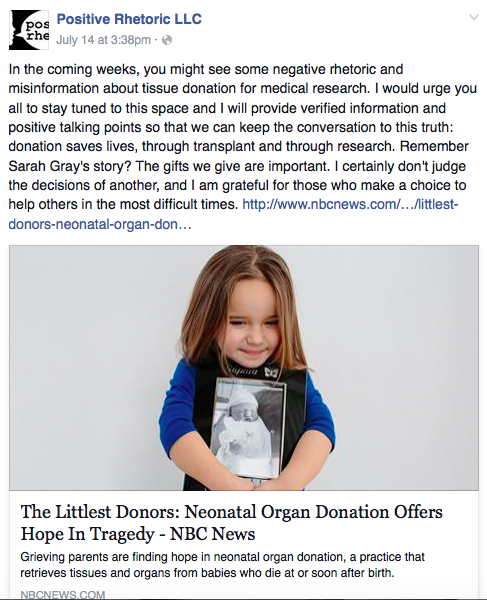 It’s been an interesting few days for people who follow media stories about tissue donation! Brianna, I don’t know what to say when people tell me I murdered my baby he was already gone. I think my family doesn’t understand what I did becaues (sic) of the news story that was on the tv. Do you know wwhat (sic) to say to them. Heartbreaking! I hate to see a special family like this hurting. And yes, I am here to help. Since the Planned Parenthood/fetal tissue for research story hasn’t gone away yet, here’s a little help for the donor families and donation supporters out there. PLEASE NOTE: the best advice I can give you is that we don’t want to seek out these tough conversations. We would rather respond kindly to misinformation than go out and find an argument. That said, sometimes hurtful and misinformed statements come your way. Let’s talk about how we talk about donation! I wanted to reach out because I saw the Planned Parenthood story on your feed. You know, good people can disagree about a lot of issues. I just wanted to let you know that if you ever have questions about how tissue donation for research saves lives, and paying for the safe storage, transport, and containment of tissue donation is legal and sensible, I’m here. We definitely don’t have to talk about Planned Parenthood, but I did want you to know that as a donor family, we know firsthand that donation for transplant AND research saves lives, and I’m happy to tell you more about how it works. See what I did there? I separated donation from the fiery debate about Planned Parenthood. That’s an important first step! Next, if people continue to post articles that talk about the *selling* of tissue, take careful, calm, and thoughtful action. I posted this to my own Facebook and Twitter feed. Finally, if you would like to point people to a technical, academic source for talking about the bioethical issues around fetal tissue donation, here’s a blog post I wrote with a bioethicist colleague at the American Journal of Bioethics. We talk about some of the finer points of separating the debate. For moving human interest stories, the newest episode of Radio Lab also tells a powerful story of neonatal donation for research, as well as this NBC story. Reading through some of the resources I have linked to, you might surmise that I have personal political beliefs that may or may not align with yours. It’s okay to disagree about these tough issues! We can all engage in respectful discourse without demeaning the compassionate gifts of millions of American families–gifts of donation, transplantation, and research. For me, I want to protect the gift, protect the intention, and protect the outcome–for life saving transplants and medical research. I hope this installment of “Say What? !” can support you if a difficult conversation comes your way! 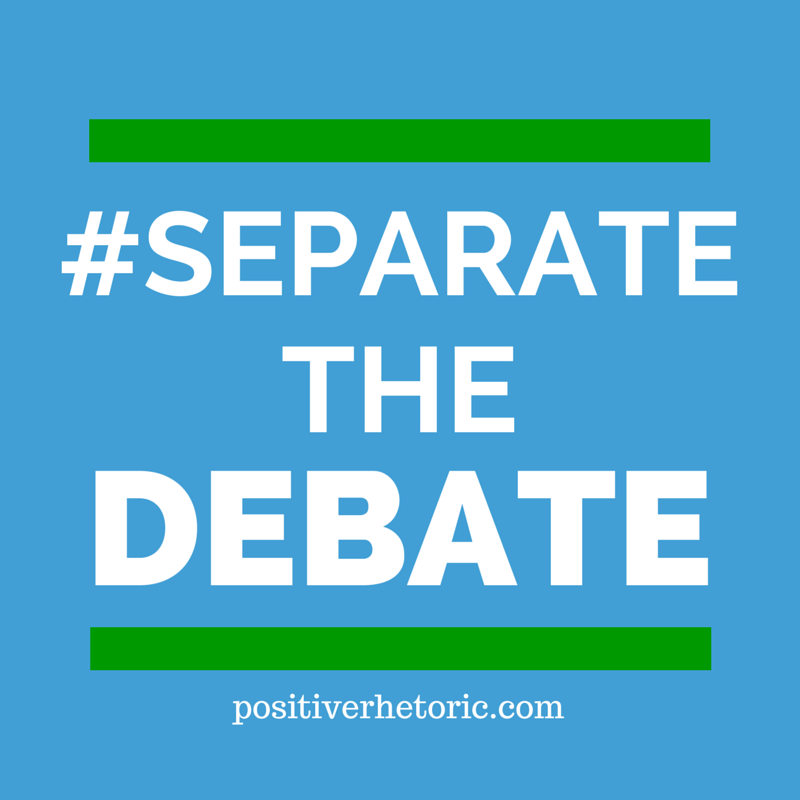 Remember, separate the debate! This has been an installment of the “Say What? !” series. Do you have a question about donation or transplantation that is hard to answer? Email me, and I’ll happily share my ideas! You can read the first two installments of the series here. Day Three: Staying Passionate, Positive, and On-point for National Donate Life Month! Today’s tip is a part of my new “Say What? !” series, where I help you answer tough questions from the public about donation and transplantation. Many of you have probably seen the tragic story about the young man in Georgia, a heart recipient, who died in a high-speed chase with police. If you have attended any Positive Rhetoric trainings, you might have an idea of what I’m going to say next. First, acknowledge the tragedy. Whatever your personal opinion might be, we can all agree that this is a very sad story. Then, give a statement of confidence in the medical professionals who make donation and transplantation possible. If someone continues to question you about the situation, keep pivoting back to one of my favorite tools: empathy. http://www.positiverhetoric.com/wp-content/uploads/2016/08/Positive-Rhetoric-logo.png 0 0 Brianna Doby http://www.positiverhetoric.com/wp-content/uploads/2016/08/Positive-Rhetoric-logo.png Brianna Doby2015-04-03 16:52:382016-09-29 16:59:45Day Three: Staying Passionate, Positive, and On-point for National Donate Life Month! 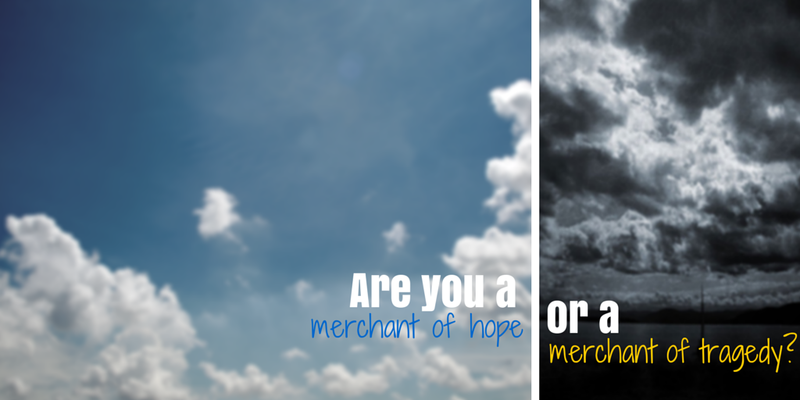 Merchants of Hope or Merchants of Tragedy? Maybe it’s all the crazy fear-mongering of my particular local elections (I’m not linking to coverage because it’s not worth your time to read the nonsense), or maybe it’s the completely bonkers media response to Americans contracting Ebola (if you’re worried, these people could really use your money)…or maybe it was this article. An article about just how many dead bodies we have to see on screens lately. The bloodless massacre of millions in a blockbuster movie. The death-y death death death of the dozens of mystery/cop/zombie/cop zombie/medical dramas. Whatever the motivator, I asked myself a question: Brianna, are you a merchant of hope, or a merchant of tragedy? You see, I work in a field where we talk about death, life, and the liminal space between–all. the. time. Every day I speak to people who almost died, people whose loved one almost died, or people whose loved one did die. We stand in the space between those who are ill, and those who are lost, and the space between them is donation and transplantation. The gift of life. Talking about hard things? Suffering? Sickness? Dying? That’s part of what happens when you work in the world. To get a transplant, you must be very sick. Very, very, very, very sick–in a way few people can understand. To have a loved one become a deceased donor–well, someone you love died. Brianna, are you a merchant of hope, or a merchant of tragedy? 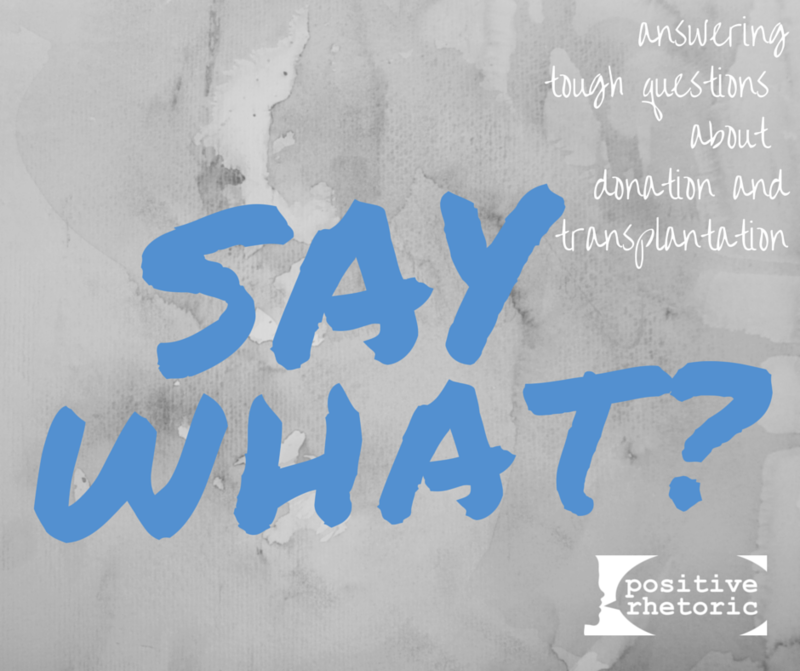 Telling the stories we do, the powerful stories that help people trust in the idea, the outcomes, and the people behind the outcomes of donation and transplantation…well, we talk about the tough stuff all the time. But, I want you to ask yourself this question: do you tell your story in a way that inspires hope? Or hope AND tragedy? Does your story scare people into worrying about a disease, an accident, a terrible what-if of circumstance? Are you pushing tragedy along with hope? Sometimes when I have spoken about my mother’s death (maybe depending on the day, maybe depending on the time), I think I have veered, as these silly television shows do, into tragedy-based storytelling. I don’t want to be a merchant of tragedy, like those crude shows. I don’t want to stress people with thoughts of death and illness and fright. I want to tell my story of hope. I have to tell them something difficult–that my mother died–but I need to make sure that the thrust of my story is not fear, nor pity–but hope. Do me a favor. Think about how you tell your story. Think about how you talk about the hard things (though I hope the inappropriate things are ALWAYS back stage!). Do you need to recalibrate your balance of tragedy and hope? Do you need to shift from darkness to light? Do you inspire others, or leave them a little fearful for the future? I’m a merchant of hope. I’m an ambassador for donation and transplantation. I will let all the others deal in fright–someone else can say BOO! http://www.positiverhetoric.com/wp-content/uploads/2016/08/Positive-Rhetoric-logo.png 0 0 Brianna Doby http://www.positiverhetoric.com/wp-content/uploads/2016/08/Positive-Rhetoric-logo.png Brianna Doby2014-10-27 01:43:482014-10-27 01:43:48Merchants of Hope or Merchants of Tragedy? Stop asking me if I pulled the plug. You know it’s bad news when a neurosurgeon breaks down into tears. But my mother wasn’t gone: she was in that bed, right there. But she’s right there. She’s not gone. What are you talking about? But…she’s RIGHT HERE. How can you lose her if she’s RIGHT HERE? STOP CRYING AND FIX MY MOTHER. But my amazing mother was gone. That’s what a subdural hematoma can do. It can take someone away from you, even when they are right there. I am a faithful daughter. I knew what to do, with the neurosurgeon misty-eyed next to me, my infant son in my arms, my mother gone and yet here in a bed. Removing ventilated support was what my mother wanted me to do, and I protected her end of life decisions, including helping her become an organ, eye, and tissue donor after her passing. Holding my mother’s hand for the 36 hours between the time we removed the ventilated support and the time it took for her heart to stop changed me forever. I was sure nothing could be worse, or more painful, than bearing witness to that end. I was wrong. There was something worse. Even typing it makes me feel sick. I cried every time. Every. Single. Time. Someone. Said. PLUG. oh my GOD, I wanted to shout, MY MOTHER WAS NOT A TELEVISION YOU IDIOT–SHE WAS A PERSON!! DO YOU HAVE A PLUG??? Listening to people talk about Melissa Rivers and her care for her mother is stirring this in me again. Melissa Rivers, I am sure, protected her mother’s end-of-life decisions. I protected my mother’s end of life decisions. It’s not an outlet and a plug. My mother was a person in this world who made decisions and plans. My mother told me what care she did *and did not* want in the case of certain medical outcomes. I worked with her medical team, and the local donation organization, to honor and protect her decisions. And if that person was a caregiver to someone, and you know they faced some very tragic and upsetting situations? Life doesn’t have a plug. Please, take care in how you speak to people who have suffered a tragedy. As in: Melissa Rivers, I am so sorry for your loss. I wish you solace in this difficult time. The way you cared for your mother was very special. I am so sorry you lost someone so wonderful. I remember the hard plastic pressing into my chest as I leaned over a hard hospital bed to be closer to my mother. She was gone, here, gone, gone, gone. I touched her hand. I told her: Mama, I love you. You are the best mother in the world. I am your daughter forever. I will let you go, Mama. I will let you go. http://www.positiverhetoric.com/wp-content/uploads/2016/08/Positive-Rhetoric-logo.png 0 0 Brianna Doby http://www.positiverhetoric.com/wp-content/uploads/2016/08/Positive-Rhetoric-logo.png Brianna Doby2014-09-07 02:08:332014-09-07 02:08:33Stop asking me if I pulled the plug. Today, the New York Times has a “Room for Debate” feature that discusses the case for and against changing incentives for living kidney donation. These are smart people, talking about complex ideas, making arguments they passionately believe in. Fantastic! Complex medical, ethical, and socio-economic issues should invite the best minds in the country to contribute their research and knowledge to finding better solutions. I am always happy to see the brilliant people put their effort towards saving more lives through organ and tissue donation. However, as the staff and volunteers at the OPOs and transplant centers that make donation and transplant possible *under our current, ethical system of compassionate, altruistic donation and transplantation*, we sometimes hear more about the myths these smart discussions stir up, than about the solutions the debates propose. 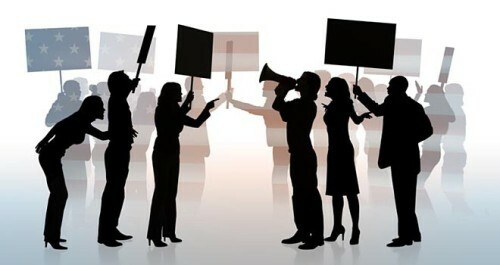 Debates are debates because people have the time, energy, research, and resources to engage in an extended discussion about a complicated issue. Having a long, intense conversation with a person standing at an elevator about a complicated issue with ample time for research and rebuttal is just not possible! 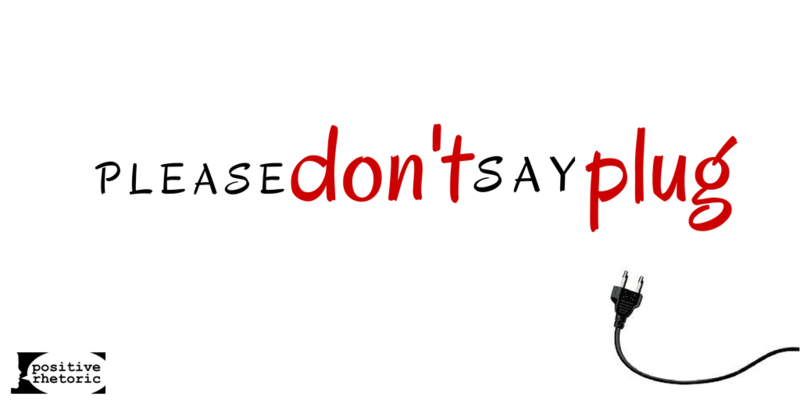 I frequently tell the people I train: many times, when speaking about a passionate belief in donation and transplantation, you might well be prepared to have the debate with a person who disagrees with your donation decision. The problem isn’t whether or not you are ready to engage that person in a discussion, the problem is 1) whether that person is ready to listen and engage in that discussion and 2) whether that person has the time and space and emotional tools to engage in that discussion. It’s not you, it’s them! And they are the intended audience–so meet them where they are, not where you already stand. Gosh, I’m not a surgeon or legislator or bioethicist. What I can tell you is that many thousands of people on the wait list die every year. Right now, you and I can help those people sick and waiting on the list by saying YES to donation and transplantation as registered donors. If the American public decides to make improvements to that system, with new programs or legislation, I certainly would support any efforts to help the 122,000 folks who are sick and slowly dying on the wait list. Goodness, that’s in the news again, right? Well, I’m no expert on bioethics or public health policy, but what I can tell you is that registered donors save lives. What you and I can do right now to help those people is make a donation decision, and tell that decision to family and friends. As with any other public health issue, I want the doctors and scientists working on this have the funding and support they need to save the 122,000 sick people who are in need of a transplant today. A lot of very smart and passionate people are working on ideas to help save the lives of 122,000 people dying on the wait list today. What I can also tell you is that donation and transplantation need support. You know the great work done by ALS advocates with the ice bucket challenge? In the field of donation and transplantation, we need debate, discussion, funding and new ideas to solve the big problem of regular folks getting very, very sick and not receiving a life-saving transplant in time. I look forward to seeing what Americans can do to register more donors and save more lives as people debate possible changes in policy! Do you like these ideas? So do the good people at Gift of Hope, OneLegacy, Donor Alliance, LifeSource, IOPO, and many more OPOs and partners in the field! I run entire trainings full of tools and tips just like this to help staff and volunteers stay positive, passionate, and on-point when telling the life-saving story of donation and transplantation in our communities. 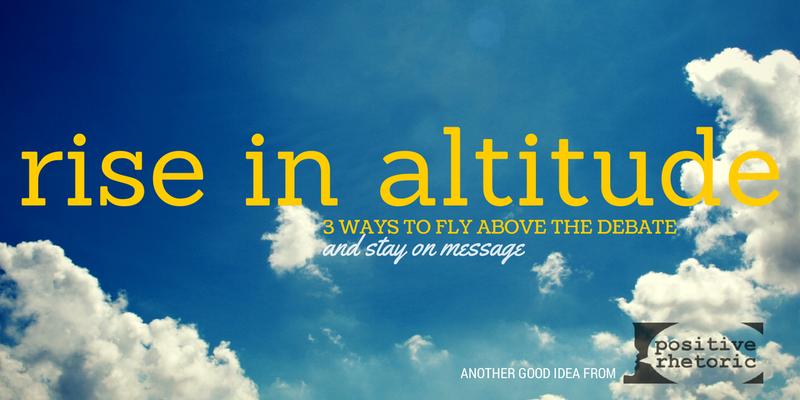 Email today to find out how I can help your organization rise in altitude to tell a more powerful story, and save more lives.